The Brisk Tea version also has historical facts, but it starts with 1901 and works forward. 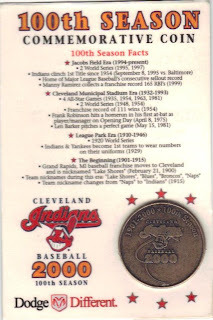 The coin is labeled "2nd of 3 Commemorative Coins." I don't know if the two coins were part of the same set, or if Brisk made 3 different versions. 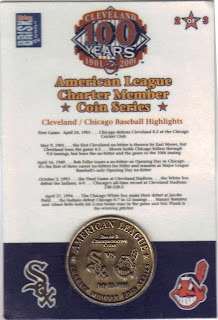 I like the fact that this coin shows the "SOX" and "INDIANS" logos, specifying the game played on July 25, 2001.